The Whiteface Lodge is the only all-suite luxury resort in the Adirondacks offering guests a superb array of services and amenities while in residence. 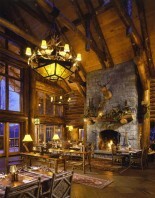 Each finely appointed suite is designed to capture a moment in the Adirondacks rich history achieving a unique marriage of rustic elegance and contemporary luxury. Accommodations include 94 one, two and three bedroom residential suites offering from 550 to 3,100 square feet of living space. The Whiteface Lodge’s Clubhouse Suites include six luxuriously appointed residences configured in two and three-bedroom suites. 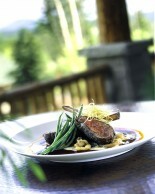 For further information on the Whiteface Lodge Accommodation see the side menu. The Whiteface Lodge Resort & Spa is located in the High Peaks region of the spectacular Adirondack Mountain range. It is adjacent to the alpine village of Lake Placid, site of two Winter Olympics, and is within close proximity to an abundance of recreational activities all year round. The Whiteface Lodge is a 5-1/2-hour drive by car from metropolitan New York City and Boston and just 2 hours from Albany, Burlington and Montreal. Commercial aircraft and Amtrak service Albany, a scenic 2-hour drive away. Private and charter aircraft fly into the Saranac Lake Airport and Lake Placid Airport, each only minutes from the resort. Private Jets can also be arranged. Please ask your ResortWorld consultant for further information. Luxury five star property, The Whiteface Lodge, is an exclusive private residence club located in the stunning region of Lake Placid in New York. Opened in 2005 this amazing property has been built to mimic the great camps built in the early 19th century by tycoons such as Rockefeller and Vanderbilt as their own private luxury escapes from city life. Ruggedly constructed from local lumber and stone, these homes or “camps” offered and still offer the utmost in comfort and luxury and blend beautifully with the majestic Adirondacks wilderness. The Whiteface lodge today recreates that atmosphere and tradition of a past era. Winning multiple awards for best hotel, best spa and top ski resort, Whiteface Lodge is arguably Lake Placid’s most beautiful and luxurious accommodation. 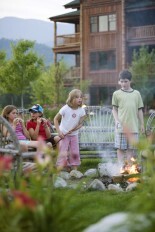 The Whiteface Lodge is a year round resort, perfectly suited for couples and families. Guests can enjoy an entire vacation without ever leaving the premises. The Whiteface Lodge is distinguished by its full-service Adirondack-style SPA, exclusive Canoe Club on the shores of Lake Placid, indoor fitness center, indoor/outdoor pools, outdoor ice skating rink, movie theatre and family game room. During a stay guests can also treat themselves to a massage at the world-class spa, catch a movie in the 54 seat theater, play a few frames at the bowling alley, or work out in the state-of-the-art gym. The Luxury accommodation at Whiteface Lodge includes 94 lavish one, two and three bedroom suites which are appointed with rough-hewn wainscoting, hand-forged fixtures, Adirondack furniture, overstuffed beds, and gas fireplaces. Equipped with a full kitchen, private veranda, and amenities such as flat screen TVs and heated floors, each suite is a luxurious home away from home. The finest and largest accommodation at the resort, the spacious 3,100 square foot Presidential Suite boasts four-bedrooms, four bathrooms, a crafted stone fireplace and a fully equipped gourmet kitchen. Whiteface Lodge offers extensive indoor and outdoor amenities, services and activities to all of its guests both on and off the property. Activities on the property include: The Canoe Club with an exclusive private beach including canoes, kayaks, volleyball, badminton, croquet, bocci ball, horseshoes, frisbee, and ping pong. Also included is a state of the art health and fitness center, year-round, heated indoor-outdoor swimming pool, ice skating rink (Seasonal), fifty four seat surround-sound theater, family game room with pool, shuffleboard, air hockey, and foosball, nightly "Experience the Lodge" family bonfire with s'mores, cigar & cognac outdoor lounge, ten-pin bowling alley, platform tennis and fishing. The surrounding Adirondack Park offers abundant recreational activities including mountain and trail hiking, road and mountain biking, fishing, Nordic and alpine skiing, tobogganing, Olympic bobsledding, ski-jumping and luge venues, five area golf courses, swimming, boating, antique shopping, museums, scenic train ride, and much more. Guest can also unwind in the award winning SPA which takes its inspiration from the complex mosaic of Adirondack Mountain life surrounding it. This intimate, 5,800-square-foot mountain spa hideaway blends the rustic beauty of its setting with a classic Zen ambiance. For further information on the SPA see the side menu.